Separation anxiety in dogs can become a serious problem if not treated effectively, especially in severe cases. One of the most common reasons that dogs are surrendered to shelters is for the destructive tendencies displayed when they are left alone in the house. Although this disorder can be difficult to overcome, learning how to help a dog with separation anxiety is the first step in alleviating the problem and restoring trust and confidence in your pup. 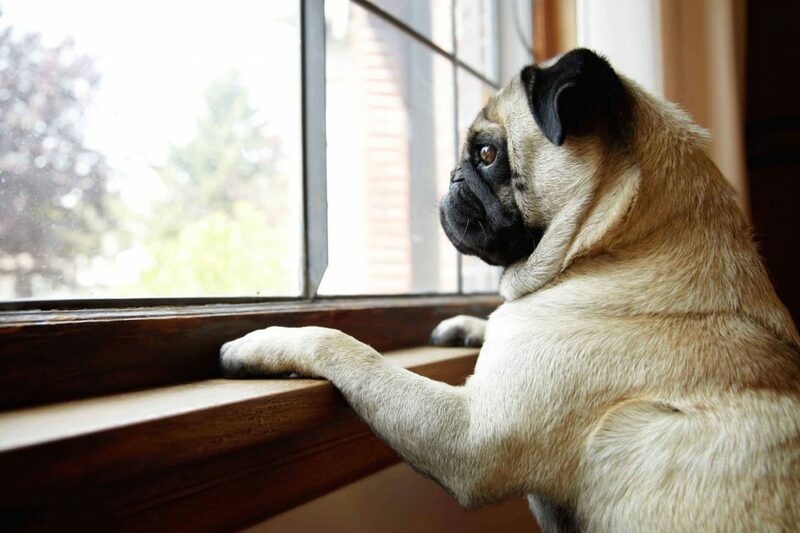 Dogs with separation anxiety can come from many different backgrounds and breeds. There are, however, a number of common risk factors you should consider when determining if your dog could potentially have this problem. Puppy separation anxiety is quite common, and shouldn’t be an immediate cause for alarm. Fortunately, this is a phase that they typically grow out of. Evolutionarily, puppies instinctively whine and cry when they are left alone in order to ensure the mother quickly returns, since they are vulnerable and unable to protect themselves. Separation anxiety is common among rescue dogs, especially if they were surrendered to a shelter or rescue organization after having a family of their own. Rescue dogs may also display separation anxiety if they have experienced previous abuse, especially as they grow comfortable with their new family and feel protected in their presence. Dogs love routine, and separation anxiety may manifest if the status quo has been dramatically changed, such as moving to a new house, the introduction of a new dog or family member, or a parent who typically works from home suddenly acquiring an office position. Changes to a dog’s daily routine signal to your pet that his or her living situation is not secure; therefore, separation anxiety develops in response to worries about permanent abandonment. Sometimes, a dog that is not properly mentally stimulated or exercised will display separation anxiety-type symptoms in response to your absence. This is especially common among breeds that have high exercise requirements, such as German Shepherds or Siberian Huskies. There are numerous separation anxiety symptoms, some of which may be easier to detect than others. Some dogs may exhibit all of the symptoms, while other pets may only display one or two. A common symptom of separation is inappropriate elimination within the household, especially in areas that smell like the owner, such as his or her bed. If accidents only occur when the owner is away, separation anxiety is likely to blame; however, it this is a habit that occurs both in and out of the pet parent’s presence, lapses in house training are more likely. The hallmark symptom of separation anxiety is destructive tendencies. A dog owner may come home to simple messes, such as garbage strewn about the house, or more costly issues, such as an expensive couch torn to shreds. If the dog is left in the yard, entire flower beds may be dug up and destroyed. If your neighbors alert you to the fact that your otherwise quiet dog howls or barks excessively while you are gone, this is likely due to separation anxiety. Dogs may be conditioned to bark, howl, and whine in the absence of their owners as a left over habit from their puppy days, where making sounds ensured the mother would return. Dogs with separation anxiety will try to escape their enclosures in order to be reunited with their owners. This can cause injury to their mouths, teeth, and paws, especially if attempting to escape a crate. When the owner is present, however, this behavior is not exhibited. A dog may pace the same path over and over in a self-soothing manner when the owner leaves; this is most commonly observed when a dog is left outside, as the pacing will form a rut in the yard. Your first step in how to help a dog with separation anxiety is to remain calm and not take out your frustration on your pet. If you feel your dog has separation anxiety, there are several treatment options available and ways to mitigate your pet’s anxiousness. Before you determine separation anxiety is undoubtedly the problem, you should first have your pet examined by a veterinarian in order to rule out an underlying medical issue, such as a urinary tract infection (if inappropriate urination is a symptom), or a neurological disorder if the separation anxiety is a recent development. The next step in treating separation anxiety is to give your pet more exercise and mental stimulation. Separation anxiety, while common, is often mistaken for destruction, chewing, and digging due to boredom or the need for an appropriate outlet for excessive energy. Take your dog for a vigorous 30 minute walk before leaving and look for changes in your dog’s behavior. A weekly visit to doggy day care may also alleviate symptoms, as playing with other dogs will leave your pet too tired to get into trouble in the following days. If your dog is not already crate trained, doing so may help your pet feel secure in your absence, and also keep him or her from causing self harm. A crate will also ensure your pet does not inappropriately urinate or defecate in the house, as dogs do not like to soil their sleeping areas. In mild and moderate cases of separation anxiety, reconditioning your pet to associate your absence as positive, instead of negative, can help solve the problem. Whenever you leave the house, give your dog a high-value treat that he or she only receives you when you leave. This should be a treat that is very exciting to your pet, such as a KONG filled with cheese or a hollow bone filled with frozen peanut butter. Over time your dog will learn that your absence results in this tasty treat, and will no longer look towards your leaving as something to dread. Severe separation anxiety in dogs can be difficult to overcome without the help of a professional. If your dog is destructive to the point that he or she is causing serious self harm or if the other techniques on this list are not productive, contact a behavioral specialist. Previous Post How to Get Rid of Fleas on Dogs Next Post My New Puppy Has Diarrhea – What Can I Give Her?